The Future is Here: The Mantis Hexapod Tank! When it comes to vehicles of the future, which may or may not include militarized land-crawlers, hexapods seem to be the way to go! Remember Project Hexapod and their Kickstarter-funded concept, Stompy? Well, it turns out an animatronics and special-effects designer who’s movie credits include “Prometheus” and “Lost in Space” has produced his own. 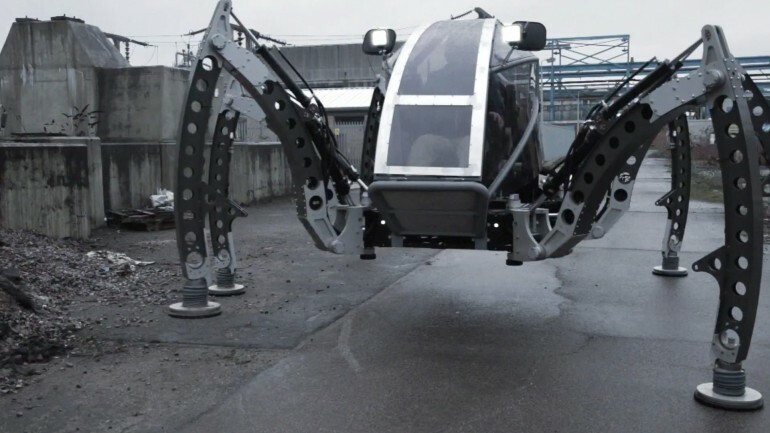 It’s known as Mantis, and while it may not be the first hexapod robot he’s ever built, it is the first giant-sized version. The product of four years of research and development, Denton has managed to create what he claims is the biggest operational hexapod in the world. Measuring some 2.8 meters (9.2 feet) in height and weighing in at a hefty1815 kilos (2 tons), the giant robot is powered by a 2.2-liter turbo diesel engine and is designed to take on any type of terrain. But given the fact that it relies on six articulating legs to get around, that shouldn’t come as a surprise. In addition, it can be controlled remotely via Wi-Fi, but why do that when you can climb into the cockpit and operate it like a true cartoonish supervillain? Naturally, you won’t seem so intimidating since the speed and power are still pretty limited, but the machine is relatively new. And in truth, hexapod technology is still in its early phases. We might have to wait a few more years before the nuclear-powered, missile-toting version is available. According to the Mantis Web site, the hexapod is available for private hire, custom commissions, events, and sponsorship. Much like Stompy, Mantis is not intended for general sale, so don’t make any plans to ride one to work in the near future either. But you might want to earmark some of your savings for the commercial model that’s sure to be released sometime in the 2020’s. Arm that thing, and Skynet has a transport vehicle for its Terminators…if it even needs one! The Wi-Fi connection gives Skynet driving skills of its own! It all comes back to Skynet for you doesn’t it? Were you traumatized by that movie as a child? What did Skynet do to you??? That might be the sexiest video I’ve seen this year so far! I can imagine this lumbering around in several sci-fi flicks….